It wouldn’t be right to visit Egmont National Park in an uncommon state. That’s why I was thrilled to see that after three continuous weeks of dreadful looming sunshine, our planned weekend would be smothered with buckets of welcoming hydration. 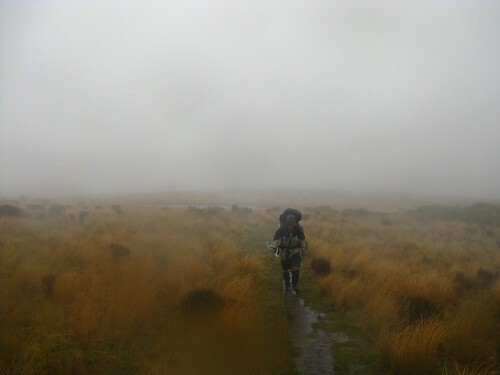 With a five hour drive from Wellington behind us, rampant precipitation began to gravitate at the approximate time we arrived at the Mangaoraka Campsite, about half way into the park up North Egmont Road. We duly set up our giant tent fly, perfectly designed to channel the all-important drops of moisture into one end and out the other. 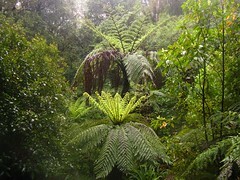 Location: Egmont National Park, from Mangaoraka Campsite below North Egmont. People: John, Bevan, Frank, Ian, Brian and me. 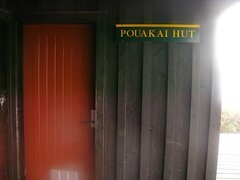 Huts visited: Kaiauai Shelter (0 nights), Pouakai Hut (1 night), Holly Hut (0 nights). 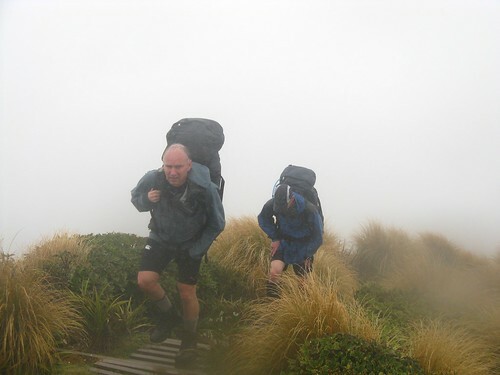 Route: Starting from Mangaoraka Campsite, follow marked traks over Henry Peak to Pouakai Hut (for Saturday night), then to Holly Hut, and continue along various tracks down to Mangaoraka Campsite. Frank, Bevan and myself had this wonderful aquatic shelter to ourselves, thanks to considerate sacrifices by the other three. Ian had brought his enclosed tent, obviously inferior to the open fly. John set up a smaller fly nearby, tailered to allow some outside air to enter, but not having such a widened gap. Brian made the greatest sacrifice, offering to spend the night in the back seat of our van. And so we spent the night. With a prized place on the end, I made sure to leave my feet out in the open to allow the dampness from the ever-increasing drizzle to seep into my sleeping bag. 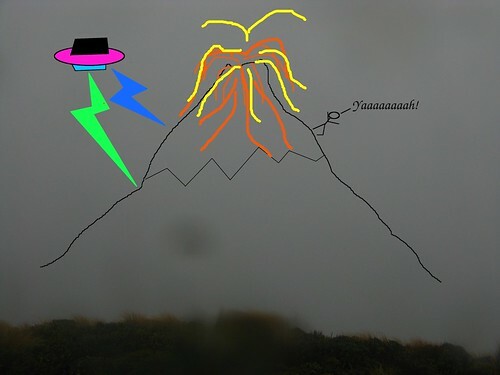 An artist’s impression of what was probably happening on Mt Taranaki as seen from Henry Peak on Saturday 20th November 2010, as carefully extrapolated from a genuine photograph and various other references. Taranaki’s like that. 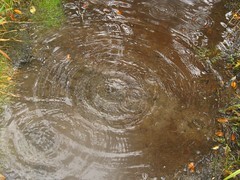 Even if you think things are going badly, you can always count on a good downpour to come along and cheer you up. It was steady in the morning when we had breakfast and packed up to leave, and just as well we had it because I’d left my sun hat at home. Brian helped me to roll up the giant fly, manufacturer-guaranteed to absorb at least its own weight in water (or your money back), and we began our walk at a leisurely 8.50am. John crossing the Waiwhakaiho River. Forested canopies sadly obstructed some of the showering that teemed from above, but happily it still made itself known by dripping down the trunks and reducing the friction of the ever-present tree-roots that dominate the up-and-down sidling tracks to the west of North Egmont Road. 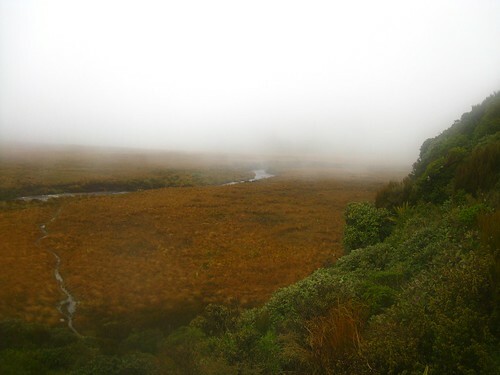 We made our way gradually along, reaching the Waiwhakaiho River at about 10. The river wasn’t flooded, likely due to the past weeks of hideous sunshine that must have starved it of its usual dose of di-hydrogen monoxide until very recently. Hopefully the river would be back to full health soon enough. Being quite high above thanks to the track we’d followed, however, we nevertheless used the bridge to cross. It was about now that Brian’s camera mysteriously decided to stop working, despite his having bathed it fairly thoroughly as he took photos during the first hour. Sometimes these things just happen inexplicably. Rather annoying, but it couldn’t be helped. 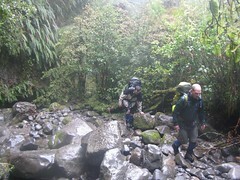 We emerged from the forest canopy on occasion, to a welcoming sprinkling from above, so as to cross occasional sidecreeks as we reached them, all generally radiating from the centre of the park as tends to happen around Taranaki. At 11.20am, we also stopped for a few minutes to bask in the sky’s drenching at the former site of Kaiauai Hut, removed 9 years previous. With the ongoing deluge now completely upon us, it was tempting to stop for an early lunch where we could enjoy it to its fullest, but curiosity got the better of us as we argued over whether the maps were incorrect in still showing “Kaiauai Shelter”, or if there actually was a shelter a little further on. We continued for a few minutes more, meeting two German girls who were also out enjoying the weather having come from Pouakai Hut this morning, crossed one more stream that had been too starved over the past weeks to yet be flooded, and eventually clambered along the track up a small bluff to discover the three-sided Kaiauai Shelter (yes, that’s really supposed to be six vowels in a row), conveniently arriving just before midday. If the shelter had been constructed without a roof, we might have been able to comfortably sit in a marine wonderland, but unfortunately the design that might have been designed to protect people from sunshine also doubled to lessen the impact of the environment as it was today. At least the seats were vaguely damp, having absorbed some of the surrounding humidity. And hey, we needed to eat lunch. Kaiauai Shelter marks the lower end of a 500 metre climb up towards Henry Peak, which would be today’s high point, and the only real climbing for the day. A sign at the bottom warned about ongoing track construction requiring extreme caution, but we saw none of it, and I’d guess the track construction has finished but the sign’s been left behind. We left the shelter at about 12.35pm or thereabouts, fairly slowly making our way gradually upwards, following a fairly good slippery-tree-root laden track. A bonus from this point on, despite the attempts of the annoying tree canopy to shield us from the sky’s constant splattering, was the increasing number of occasions whereby the track allowed pools of liquid, often up to ankle deep to ensure a good splashing. Often a down-side of reaching points above the bush-line is that one leaves the excitement of slippery tree roots behind. 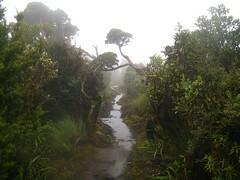 Egmont National Park is different, thanks to the good people of the Department of Conservation. In a word, boardwalks. More specifically, boardwalks and steps and ladders, all made of wood, are everywhere around here, and they’re nearly every bit as lacking in friction when wet as the typical tree root. I guess when the real thing won’t grow, something man-made may just be the next best. We reached the first of these sets of steps at about 1.20pm, and briefly regrouped before heading along the steps and boardwalks into the humid tops, at a high point of Henry Peak, where we arrived at about 2pm. Thankfully the Sun remained well hidden, and so I was at no immediate risk of melting after having left my sun-hat at home. On the other hand, rumours of a mountain in the region remained unconfirmed, and we could only imagine what must be happening through the fairly thick layer of cloud that typically dominates here. We carried on along the boardwalks to Pouakai Hut (arriving around 3.10’ish), and despite considering the possibility of carrying on to Holly Hut for the evening which would give us the opportunity to keep experiencing the weather while it lasted, out debate decided it could be even more favourable tomorrow with a southerly front coming in. We elected to stay the night where we were, along with the 13 people up from Spotswood College who were already present when we arrived. There’s plenty of room, though, and everyone shifted around in a way that let the six of us get an entire bunk room for ourselves. It was very hot inside, though, with the fireplace roaring (I had trouble understanding recent complaints in the hut book that the fireplace didn’t work well). I spent significant time standing out on the deck, continuing to take in the muted atmosphere as the sky continued to spit towards us. On Sunday morning we woke early at about 6.30am, but prepared lazily. It indeed appeared to be more favourable walking — I poked my head around the corner of the hut, and was swiftly blown about a metre from where I stood. No doubt a recipe for a great day. By the time we left at 7.45am, conditions had barely changed at the level of the hut, but sadly as we climbed, the wind died down a little. Perhaps at the location of the hut, things had appeared more windy than they actually were, due to various geographic features. The boardwalked and stepped track continues along and around towards Holly Hut, and trends downwards for much of the time in doing so. A happy feature amongst the boardwalks is the tendency for them to sink into the surface mud, helping to ensure our boots (and sometimes ankles) remained soaked to the fullest possible extent. 90 minutes after leaving, we we dropping down into the Ahukawakawa Swamp, one of my favourite parts of Egmont National Park. I think I like the colours, and the way they show up in the dull-lit ambience that surrounded us. The various giant domes, which at one point shot out of Mt Taranaki and more or less splattered around the landscape, weren’t too visible today except for brief glimpses. Mt Taranaki still wasn’t visible for that matter, either, and once we reached Holly Hut at 9.45am, I could only imagine what must be happening on the mountain. We had a snack in Holly Hut, which had surprisingly been empty the previous night, then returned to our loop about 30 minutes after arriving. We’d had a brief discussion about whether we might want to take the fun route to North Egmont, higher in the clouds, then walk down the road to where the van was parked, but in the end we resolved to aim directly for our van, since it was to be a long drive home. At least this could mean more slippery tree roots down the hill. At first, however there were more waterlogged boardwalks to traverse. Brian on the Kokowai Track. 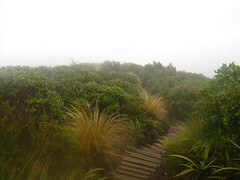 At 11.10am, the six of us reconvened at the well signposted track junction leading down Kokowai Track, which would take us half way down North Egmont Road, bypassing the visitors’ centre at North Egmont. I’d presumed this would be another slippery slope down tree-roots, but disappointingly it was only the first part, generally above the bush-line, which lacked adequate friction. Shortly before 12, we were under trees, and the ground was surprisingly dry. 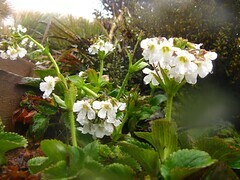 This may have been because the mysterious mountain we’d heard rumours about was sheltering the area from the southerly. This track, as well as other parts of the park, has a number of ladders, which are uncommon in other parks I’ve visited, and for most of the ones we saw, it was possible to see where people had previously formed tracks up the sides. I have a suspicion that when the boardwalks were ordered, someone simply decided to throw 100 ladders into the order, and then scattered them to various places around the national park. 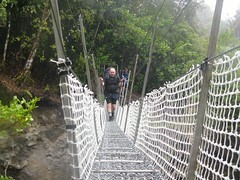 Soon after 12.30pm, we reached the bridge over the Waiwhakaiho River, which we’d crossed early the day before. It was a good thing that we were so close to our transport away, because sunshine was now threatening, despite a wavering mist of drizzle blowing over us from somewhere distant. Most of us stopped here for lunch, but John ran ahead to collect the van from where we’d left it at Mangaoraka Campsite, and we made an arrangement to meet him at the road-entrance slightly further up the road, which was closer to where we ate lunch. The five of us were away again at 1.30pm, and about 20 minutes afterwards we finally walked out to the road, a few minutes before John drove up to collect us. That was quite good timing. 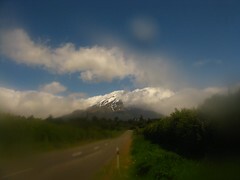 About now, and as we drove away from Mt Taranaki, the Sun re-emerged completely and the mountain revealed itself from the enshrouding cloud. I’m glad this didn’t happen while we were there—it’d have felt as if we didn’t get a genuine experience. 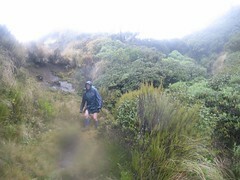 This entry was posted in tramping and tagged bagged:holly hut, bagged:kaiauai shelter, bagged:pouakai hut, department of conservation, egmont national park, rain, tramping, wellington tramping and mountaineering club. Bookmark the permalink.